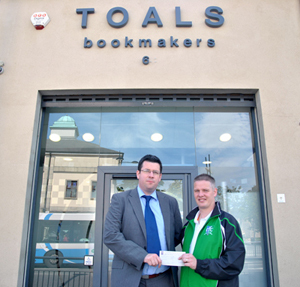 Dan Mallon from Toal’s Bookmakers presents a sponsorship cheque to Downpatrick FC’s Tony Mc Shane. (Photo By Thomas Leckey). Downpatrick nearly paid a heavy price for coming out of the blocks in a slow fashion in their first league game at Dunleath. Killough raced into a third goal lead before the youthful Downpatrick team got out of first gear. Over an hour had been played in the match before Downpatrick started their magnificent comeback. Gary Ross managed to get onto the end of a Joe MacNabb cross to head in Downpatrick’s first goal. This goal sparked Downpatrick into life as they started to pile pressure onto Killough’s defence. With ten minutes remaining Downpatrick managed to pull another goal back, after good work by Paul Gilgunn in midfield the ball eventually fell to substitute John McCormick to tap the ball into the Killough net. Downpatrick’s equaliser came with minutes to go and what a goal it was. Gary Ross picked up the ball just inside the Killough half before advancing 10 yards and unleashing an unstoppable shot which rocketed past the stranded Killough keeper into the net. 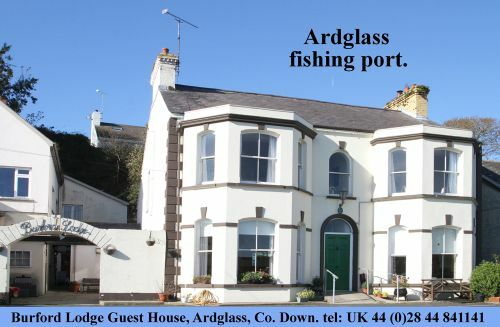 Next up for Downpatrick 2nds is a Home game to Annalong Rangers.